Three years after being abandoned and left to fend for himself, a young stallion has become the perfect show horse, and qualified for the Hickstead Royal International Horse Show. Striking black and white cob Jack was taken in by Blue Cross after he was found wandering the lanes of East Anglia, snacking on the verges while the traffic tried to avoid him. The police signed him over to Blue Cross and he was taken to the charity’s Horse Centre at Burford in Oxfordshire. Although Jack wasn’t in bad condition and was a happy, friendly chap, he needed a full veterinary assessment and a foot trim, vaccinations, a microchip and a passport. He was also castrated. With his good looks and flowing paces Jack quickly became a favourite at Burford. They knew he would find a home in no time and Sheila Henry couldn’t believe her luck when she found him on the Blue Cross website two years ago. Sheila took Jack on as a youngster project and did all the groundwork herself to introduce him to driving and riding. Friend Lacey Smith now rides him at shows while Lacey’s father, Andrew, is groom and helper. Sheila is immensely grateful to both of them for the generous support they provide. Jack when he was taken in by the Blue Cross. 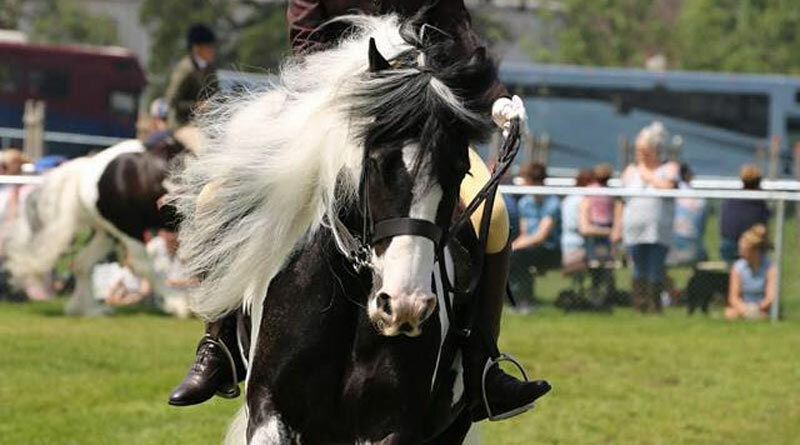 Jack rarely comes home without a rosette and one of last year’s most impressive accolades was being awarded the title of Gypsy Cob of Great Britain at the Royal London Show at Keysoe, Bedfordshire in September. Laura Pearce, Horse Rehoming Coordinator at Blue Cross Burford, said the team was very proud of Jack and Lacey. “In the two years that Sheila has had Jack he has represented Blue Cross in in-hand showing, driving and ridden showing, going from green two-year-old to a winning show horse under saddle,” Pearce said. Blue Cross recently offered Sheila the opportunity to take on the full ownership of Jack under their ownership transfer scheme. She jumped at the chance and has thanked the charity for allowing him to become officially hers. “But actually, it is Blue Cross who should be thanking Sheila for giving Jack such a wonderful home,” says Laura. Blue Cross rehomes its horses and ponies on a monitored loan basis. Following a successful loan period, the ownership of some horses can be transferred to the loan home. This enables the charity to free up resources to take in more homeless horses who need help. The charity has plenty of young quality horses and ponies like Jack who are looking for new homes. Visit www.bluecross.org.uk to find out more or to make a donation.